Extron Electronics announced the immediate availability of the Quantum Ultra, a modular 4K videowall processor with high-performance scaling and windowing technology for a wide range of applications. The Quantum Ultra features the Extron Vector 4K 4:4:4 scaling engine and 400 Gbps HyperLane video bus capable of carrying a multitude of high-resolution sources for unmatched real-time performance. A single processor can support multiple videowalls with mixed resolutions and screen orientations, providing flexible system design with minimal complexity and cost. Portrait and landscape output support, output overlap and mullion compensation provide compatibility with nearly any display technology. RS-232 and Ethernet interfaces provide direct connections for control systems. "The Quantum Ultra features Extron HyperLane bus technology, powerful processing, and robust, secure operation for dependable, real-time performance unmatched by other videowall processors," said Casey Hall, Vice President of Sales and Marketing for Extron. "It will meet the growing demand for 4K videowall solutions in mission critical AV environments." Quantum Ultra utilizes a modular card-frame architecture that can be populated with input and output cards selected to match source and display requirements. Multiple card frames can be configured and operated as a single system to accommodate any size videowall. Quantum Ultra can accommodate a mixture of display devices with varying resolutions. Features such as output overlap, mullion compensation, and output rotation provide compatibility with current and future display devices. The future-ready Extron HyperLane bus delivers real-time performance. It has a maximum throughput of 400 Gbps, sufficient to simultaneously carry more than twenty 4K/60 sources with 4:4:4 chroma sampling. It also possesses the bandwidth required to support evolving signal formats, such as 8K, and the higher resolutions, high dynamic range - HDR, greater color depth, and expanded color gamut these signals will provide. Sources can be windowed and positioned anywhere on the video display. Static image files such as logos and maps can be stored locally on the Quantum Ultra and displayed with full keying and alpha channel support. Internally generated clocks can be presented in a variety of time formats, in multiple time zones. The integrated VNC client can decode multiple simultaneous VNC server streams for presentation on the videowall. Custom color borders can be applied to any window, with support for rounded corners, drop shadows, flashing, and transparency. Quantum Ultra was engineered for continuous operation in mission-critical environments. 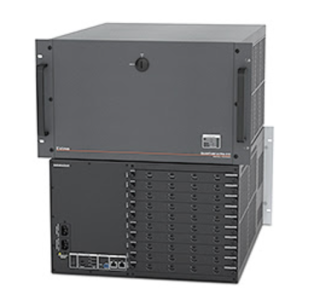 Redundant, hot swappable Extron EverLast power supplies, dual IEC power connections, a write-protected, solid-state operating system drive, and secure communication protocols, ensure system redundancy, security, and stability. Quantum Ultra setup and preset configuration are performed using Extron VCS - Videowall Configuration Software. System configuration is broken down into logical tasks, such as wall configuration, source setup, preset design, and EDID Minder for simplified integration. Online and offline editing allows creation and configuration of systems with or without an attached processor. Familiar editing controls streamline layering, aligning, and sizing of source windows. With an intuitive workflow and familiar interface, VCS provides efficient configuration of any Extron 4K videowall processor.